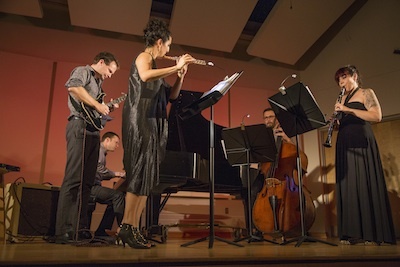 NOW Ensemble returned to NMNC to kick off our fifteenth anniversary season, performing pieces by Patrick Burke, Sarah Kirlkand Snyder, Judd Greenstein, and Scott Smallwood. 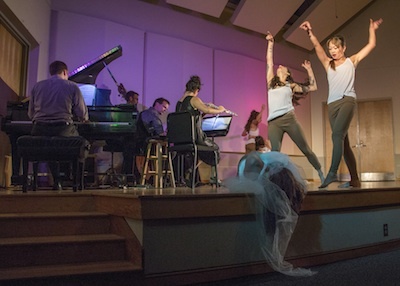 The entire second half of the concert was devoted to a world premiere of NOW guitarist (and New College Visiting Assistant Professor of Music) Mark Dancigers's Dreamfall, a three-movement piece that also featured Sarasota's Fuzión Dance Artists (Hannah Jordan, Molly Nichols, Wendy Ricci, Mary Richardson, and Xiao-Xuan Yang Dancigers; Directed by Leymis Bolaños Wilmott and co-choreographed by Xiao-Xuan Yang Dancigers and Leymis Bolaños Wilmott). While in residence, NOW (Alexandra Sopp, flute; Agnes Marchione, clarinet; Logan Coale, double bass; Mark Dancigers, electric guitar and composer; Aaron Wunsch, piano; Patrick Burke, composer; and Judd Greenstein, composer) led a group of New College students, faculty, and staff in a workshop performance of Terry Riley's In C and gave a demonstration of compositional and performance techniques to students at Booker/VPA High School. 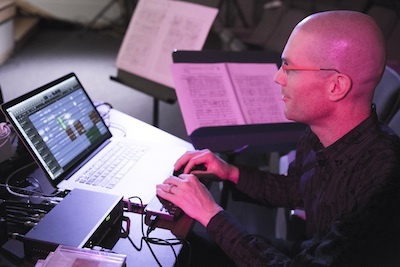 Composer, performer, and polyartist Francis Schwartz was back at NMNC to lead a concert of works composed by himself and his friends John Cage, Pauline Oliveros, and Eduardo Kusnir. Joining Schwartz were mezzo-soprano Isabelle Ganz, double bassist John Miller (principal of the Sarasota Orchestra), guitarist Mark Dancigers, a chorus of New College students, and for the finale, ALEA 21 ensemble, led by Manuel Ceide—live, from Puerto Rico, via Skype. Schwartz, Ganz, and the New Music Polyartistic Chorus (Janeway Amos, Erich Barganier, Amy Bortolotta, Moriah Bray, Aamna Dhillon, Tagen Kaestner, and Lily Wohl) led off with Schwartz's The Headless Glory of André Chénier, which, like many of his works, involves some audience participation. Then Dancigers followed with the solo We've Got (Poly)Rhythm: Homage to Gershwin, and Schwartz and Miller performed Oliveros's reflective The Blue Heron. Ganz wowed (and ventured into) the audience with her performance of Cage's Aria, with the graphic score projected on the rear wall of the space. 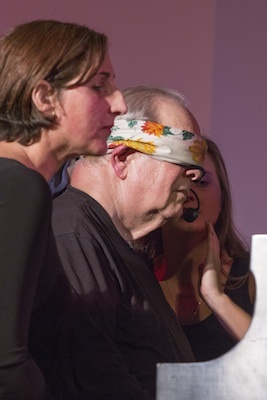 Then Schwartz played Kusnir's Brindis X blindfolded, with two "informants" whispering directions in his ears. To end the evening Schwartz presented the world premiere of his Shady Intercontinental Songs with Ganz, Miller, the chorus, and—after some technical hitches—the ensemble from Puerto Rico joining in for the final movement. 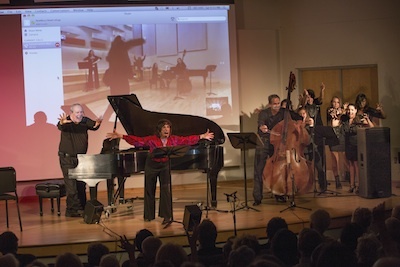 Video of ALEA 21 was projected as they followed Schwartz's conducting. 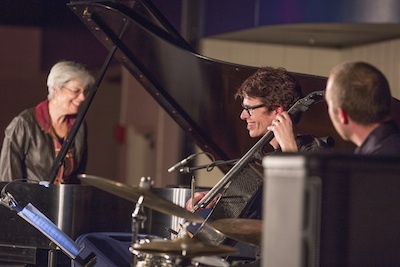 From Toronto pianist Marilyn Lerner returned to NMNC and brought cellist Matt Brubeck and drummer Nick Fraser with her. Together they comprise Ugly Beauties, and the improvisations they made were anything but ugly. 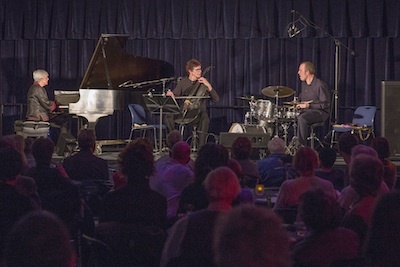 The concert included works composed by all three musicians, and each piece was a framework for improvisations. 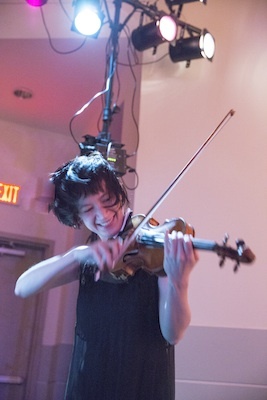 The tunes ranged from slow ballads (including a song of Lerner's so new it had only the working title "New Tune") to fast, angular romps filled with virtuosic playing that electrified the crowd in our improvised Club Sudakoff. Ugly Beauties worked with New College students while they were here, workshopping with the DIY Ensemble, a group led by Visiting Assistant Professor Mark Dancigers who were devising new music for their self-created instruments (read about their NMNC concert in March below). In collaboration with New Music New College, The Ringling as part of its New Stages program hosted the phenomenal string quartet ETHEL and Native American composer, musician, and storyteller Robert Mirabal. The Ringling asked NMNC to assemble a chorus for a series of pieces in the second half of each of the four concerts, Music of the Sun. 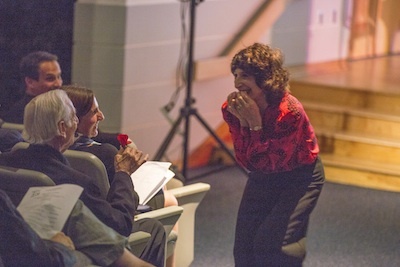 The singers included New College students, faculty, and staff, as well as members of the Sarasota community and rehearsed on their own for several months before four frenzied days of rehearsal and performances with ETHEL and Mirabal. In addition to three Songs of the Sun (music by ETHEL's Ralph Farris and words by the poet Harry Smith) Mirabal had them participate in two chants, one of which was a world premiere. The DIY Ensemble, eleven New College students who worked with Visiting Assistant Professor of Music Mark Dancigers during the January interterm, made and/or modified their own instruments, then devised music for these creations. 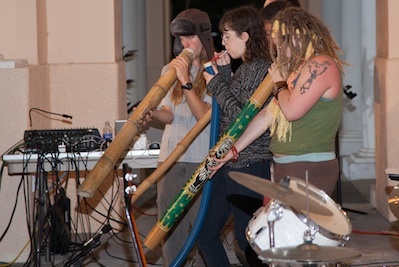 Under the stars in the PepsiCo Arcade their concert began with Dancigers's Flagner the Dugong Sally, a group improvisation in four sections. 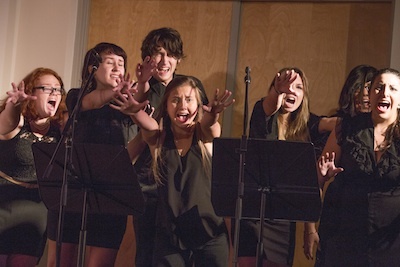 This was followed by two pieces composed by the ensemble (Hana Alqasem, Erich Barganier, Dylan Burchett, Daniel Crumpler, Jacquie Fockler, Brendan Hobson, Orion Morton, Jacob Parker, Kamron Scruggs, JazzFlower Weigel, and Haiwen Yu): The Sea Monster's Lament (featuring a sixteen-foot-long bamboo didgeridoo) and Electric DIY Gamelon. Duo by Burchett and Scruggs used modified electronic equipment including an old overhead projector as sound sources. 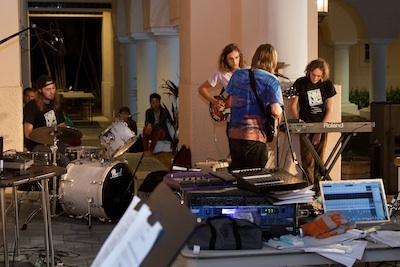 Then Barganier's Solo used an increasingly chaotic computer program (whose code was projected on the back wall) to devolve sound electronically while he accompanied on drums. 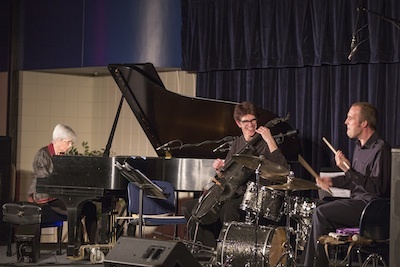 The student band Deep Lynx (Burchett, Matt Morgan, Dylan Robitaille, and Scruggs) played three of their compositions, Happening, Mr. Dad's Merry Ride Through Christmas Town, and Something Similar. For the finale NMNC Producer R. L. Silver composed I'm Sorry, Steinway for all the performers. 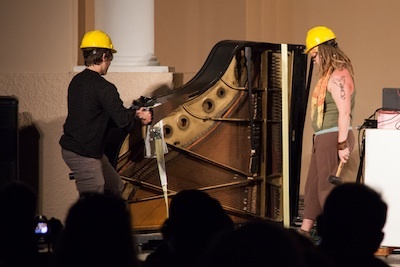 One of the instruments the DIY Ensemble worked with was a defunct Steinway grand piano, one in such a condition that it could never again be a playable instrument. 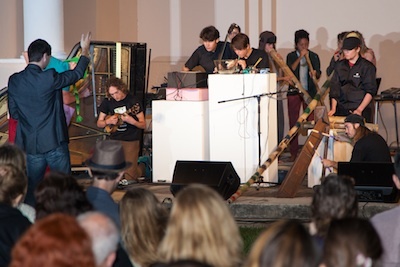 For the earlier pieces they repurposed it and used its strings, hammers, and soundboard to generate various sounds. For this piece, two "Destructors" worked at it with a saw and hammers, and the resulting resonant sounds were amplified. Before the concert several students demonstrated their instruments to audience members at various parts of the Arcade. And a few weeks after the concert Dancigers, Silver, and Scruggs gave a demonstration and mini-concert to music students at Booker/VPA High School. 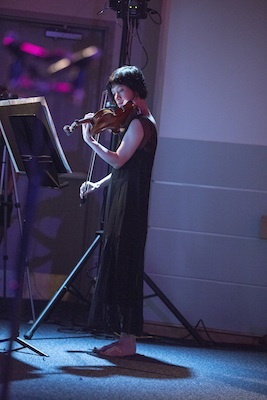 Our fifteenth anniversary season ended with violinist Miranda Cuckson (her second appearance at NMNC) and electronics specialist Christopher Burns performing Luigi Nono's modernist work La lontananza nostalgica utopica futura. This single concert-length piece involves virtuosic playing, movement throughout the entire auditorium, vocalizing, and playback of eight channels of material recorded by Nono and violinist Gidon Kremer. The playback, masterfully controlled by Burns, came and went from speakers all around (and above) the audience as Cuckson wandered from one music stand to another—on the stage, in the pit area, in the aisles. 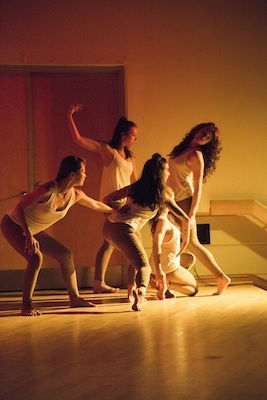 The overall effect was mesmerizing, disconcerting, entrancing, and very moving.